I need to generate a calendar-based lunch ordering system for my kids' school. What I am looking for is two drop downs (for meal and beverage) and a submit button in each square. Maybe I could modify one, but I tried and it did not work very well. Would you be able to whip one up? This is a tremendous product. Thank you. 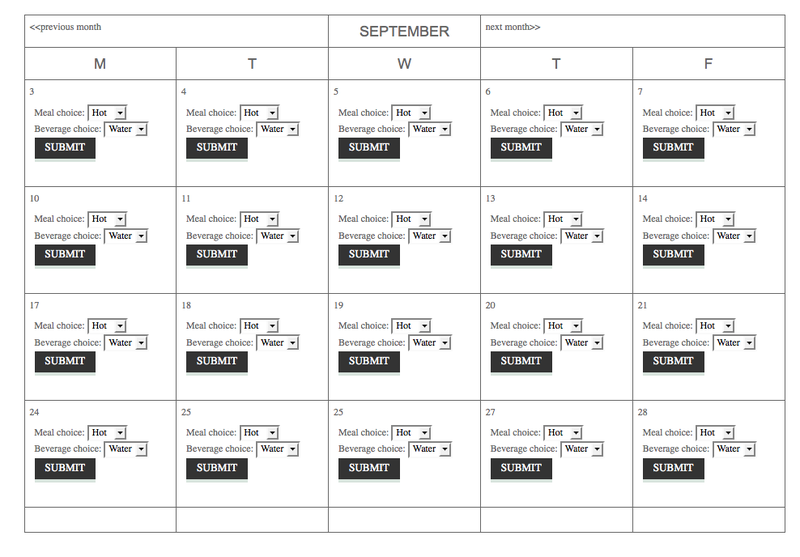 Hi I apologize, but unfortunately we do not currently have a feature available for using a Calendar within your Forms. This idea is and has been on our Features Request List of things to release in future updates on JotForm and it has been acknowledged by our Developers but I cannot currently provide you with an exact quoted ETA for it so it may still yet be awhile but eventually we will release something of the sort. The only suggestion I can think of that would work is if you happen to know someone who does programming that could create something like that for you.